Between bad proposals, and the best intentions the timing couldn't be worse. Lobbyists know that our legislators have blind spots. Its not that all legislators are blind, ignorant, foolish, or even downright incompetent. Just most of them falling into one or more of those categories. Unfortunately, some have gone back to the trough of stupid ideas a little too often. Enough in fact, that they don’t even see the real reasons they are suddenly inundated with far reaching demands for change emanating from the pits of hell masquerading as fixes that are long overdue. The convention of states (COS), and National Popular Vote (NPV) are two such changes that if successful, could threaten our very Republic. The COS, in a way that opens the doors to quite literally writing out the very protections enshrined in our constitution. The NPV, as a means to enable mob rule, and permanently entrench those who can then control media and other information sources. And what about that NPV? As we go through the daily motions of our lives during this September 11th, hopefully some of you will either take the time to attend one of the 9/11 remembrances around Michigan or to reflect upon what we have lost as a republic ever since that fateful Monday morning 17 years ago. This is the same Republican state Rep. Lisa Posthumus Lyons, Guv wannabe Bill Schuete just tapped on to be his LG. I told you so just doesn’t cover it. I’m going to keep this one a little short today. Part of it because I’ve had a very long weekend. Part of it because I’m still going over the actual returns. The Devil is DEFINITELY in the details. Multiple news outlets have reported that the Michigan Supreme Court in a 4-3 decision upheld the democratic party “independent/grassroots” Voters Not Politicians petition initiative to create a non-partisan commission to redraw every voting district in Michigan. Yeah that’s sounds great on paper, but exactly how did they intend on accomplishing this nigh impossible feat? We DID just dodge a bullet (in 2018). Well Southeastern Michigan Taxpayers can breath a little bit easier (for 2018 at least). One potential drain on our wallets has been thwarted, but there is another one in the offing. I have two items to pass along to readers relating to the proposed revisions to the Social Studies Standards here in Michigan. Fractured Fairy Tales and other flights of fancy finding their fantastic and far-fetched fables in a Michigan Classroom near you very soon. Did you know that Harvey Milk and Huey Newton were very important figures in early American History? Even moreso than the likes of say Dr. Joseph Warren or Patrick Henry? Did you know that the federal government is not actually a creation of the states and is therefore superior to them? Did you know that the Southern Poverty Law Center is an unbiased and trustworthy source of information ? Did you know that the MDE actually proposed expanding a study of Islam in public schools (despite the fact Christianity has been essentially removed from the classroom beginning in the 1960‘s)? And my personal fav: Did you know that America was founded as a democracy? Yeah, that one surprised me, too. If the Michigan Department of Education (MDE) has their way, THESE are changes that you might see in the K-12 curriculum in a classroom near you. Unless you do something about it. 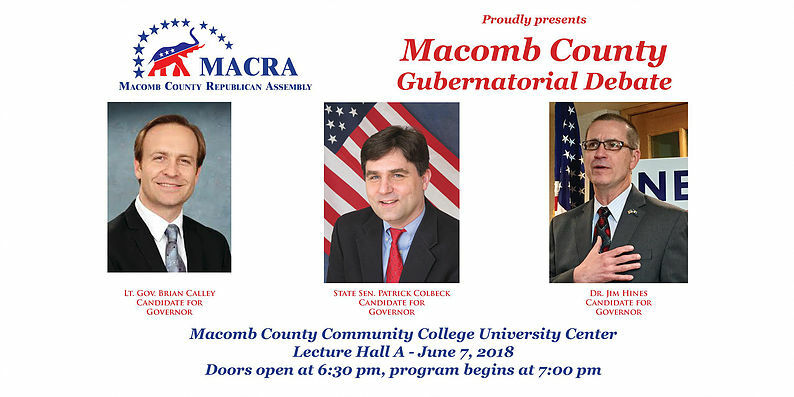 The Macomb County Republican Assembly will be hosting the first gubernatorial debate to be held in Macomb County in 2018. Sen. Pat Colbeck, Dr. Jim Hines and LG Brian Calley are all scheduled to attend. Citing yet another “scheduling conflict” AG Bill Schuette will not be attending this event. The event will take place at Macomb Community College University Center on June 7th. Doors will open at 6:30 pm and the debate begins at 7:00pm. The debate will be moderated by Charlie Langton along with Kathy Hoekstra and Nolan Finley. Tickets for the event will be free, but there is a limit of two and must be reserved here first before attending. There will be no tickets available at the door. Michigan’s legislature is considering a bill that would allow the Great Lake State to join a growing roster of states that have legalized online gaming. Legislators would be right to ignore the scare tactics of legislation opponents, much of which, ironically, is funded and supported by gaming interests in Las Vegas. For decades, the Department of Justice (DOJ) imposed a blanket ban of states legalizing online games of chance. Thanks to pressure from states and some court cases, the DOJ in late 2010 reversed course and allowed states to make the determination themselves. New Jersey, Delaware and Nevada were the first to legalize online gaming for their residents. Opposition to the effort has been funded almost exclusively by Las Vegas billionaire and casino mogul Sheldon Adelson. Mr. Adelson has funded an organization dedicated to fighting legalized online gaming. A group called the Coalition to Stop Internet Gambling magically appeared. Lobbyists, like former Democratic Senator Blanch Lincoln, were hired and poll-tested and focus group language were employed to restore the federal prohibition.